Charlene tries to persuade Madge to phone Mr Bishop. Shane asks Charlene not to be so hard on Paul, but she thinks he has ruined Clive's life. Charlene reads Scott's latest article and tells him that if it is published it will cause a stink he will never hear the end of. Scott is shocked by Charlene's reaction and he wants to know what is wrong with them. Charlene thinks that all hell is going to break loose that is what wrong with them. Scott smirks “And so it should these articles are going to make me a household name”. Charlene argues they sure will and she wouldn't like to be called by it. She thinks that he is going to hurt people. On the defensive Scott says that he hasn't used people's real names. Charlene replies that he has used everything else. Scott thinks that no one will guess, he thought she would understand. Scott gets up in a huff and starts to walk out. Charlene stops him and tells him that this is no way to impress his father. Scott doesn't know what she means. Charlene understands that Scott is trying to prove his father wrong and show Jim he can make it as a journalist but this is not the way to do it. Scott says it isn't just like that, my HFC results were like a kick in the guts, you all did so well. 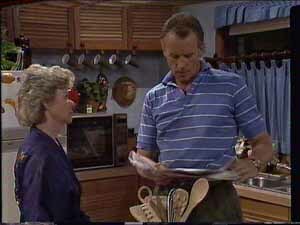 Then the Erinsborough News publish the “Bess Robinson Story” suddenly he felt like he was worth something, he had found something he could do. He is a success and he isn't going to let that go no matter what. As he goes to leave he continues I just wanted you to give me a hand with it. Charlene suggests that they go to his place to type it up. Scott replies that he didn't think she approved. Charlene says that she doesn't but who is she to stand in the way of creative genius. Clive sits looking totally miserable on the back stairs, as he sees Shane approach he jumps up and starts jogging on the spot. Shane starts to say that he has just dropped in to say…but Clive cuts him off and makes a joke about the law of gravity doing the same thing to apples. As Clive jogs off around the garden followed by Shane, Shane remarks that Jane has gone back home. Clive says that he sent her there, he hasn't had the house to himself for ages and he just loves it. He can do what ever he likes day or night and he will never run out of toothpaste again. After circling the garden furniture, Clive lies on the grass and starts doing exercises. Shane suggests that they go down the pub he knows how hard it is when you break up with someone. He knows how he feels, he can't fool him, Clive just replies that there is no point dwelling on it. Shane doesn't think there is much point putting on a brave front either, especially when he has some really good mates willing to help him out. Clive gets up again and starts jogging once more. Clive replies. “Of course they are, the sun is shining, the birds are singing and everything is going to be alright.” He thanks Shane but says he has a lot of work to do. As Shane goes he asks him to give him a shout if he needs anything. After he has gone Clive's sunny disposition drops and he goes back to looking miserable once more. Helen comes off the phone and tells Jim that she has been called to The Ramsay House for an emergency meeting. Walking into the kitchen where Scott and Charlene are working Helen then gives Charlene a message from Madge “The lunch was ruined and not to hurry home” Charlene says the lunch was in the oven and she had forgotten all about it. Lucy wants to know kind of emergency meeting it is, but Helen won't tell her. Lucy then moans about nobody telling her anything. Lucy leans over Scott trying to read what he has written on the typewriter (strange device pre laptop!) and informs him that that is not how you spell “jilted” Scott irritated tells her he knows it is a typing error. He pushes Lucy away, who protests that she is just trying to read it. Scott tells her not to, he is trying to work. Still protesting Lucy says that he let's Charlene read it, Scott replies that Charlene doesn't read aloud. Lucy doesn't think it is fair, Scott tells her to “Rack Off'. Lucy then gets annoyed and says she is going to write her own story about horrible big brothers and storms off in a huff. Jim then wanders into the kitchen and asks what he is writing about horrible little sisters. Covering the typewriter so Jim can't see, Scott replies he can read all about it in the paper, under the bi-line “Scott Robinson” Jim tells Scott that he is very proud of him, but just because they published the first article doesn't mean they will publish the next one. Mr Cutler himself said he had a lot to learn about being a journalist. Scott smirks and turns to Charlene and says they will publish this one won't they, Charlene thinks they definitely will. Jim continues that he doesn't want to be a wet blanket but he needs training, no one could be a doctor or an engineer without training. He continues that he had run into Scott's form teacher and he had said that they would be no problem with him repeating his final year at school. Scott is furious and shouts that he has told him a thousand times that he doesn't want to go back to school. He gets up, gathers his journal and storms out of the room. Clive looking depressed is tapping his bongo drum moodily as he sees Madge approach he starts hitting it more in rhythm and asks her if she has come for his autograph. Madge says that she has come to see if he is alright. Clive says he is fine, he was just having a jam session, it is great to have the place to himself; no babies, he can really let go. Madge says that it didn't sound like a jam session to her, Clive jokes what if I said it was Beethoven's concerto for two fingers and a bongo. Madge feels that Clive doesn't have to pretend with her, she wants to know honestly how he is feeling. Clive says that he gets a bit lonely now there are no nappies to change. Madge invites him to dinner, but Clive jokes about there being any nappies to change over there, he thanks Madge but says that he has so much to do. Clive makes all sorts of excuses as to why he can't come, but Madge finally talks him around saying it is just a quiet dinner with friends. Clive says he will bring some photos of Sam which have just come back from the developers. Scott is still typing away with one finger, when Lucy comes in and asks what any other word for “Horrible” is. In true loving brother style he tells her to “Rack off” Lucy replies that she doesn't want to read his story anymore she is written her own all about a beautiful princess who gets locked into the tower by her horrible brother. Scott doesn't need to know where she gets her inspiration from. Lucy continues that the only problem is that she has used the word horrible four times already. Scott hands Lucy “Roget's thesaurus” Lucy is rather confused and asks Scott if he is writing about dinosaurs. Scott explains it is a type of dictionary and suggests she looks up horrible as it will give her heaps of other words he could use instead; he then pushes out of the living room where he is working into her bedroom. Madge has finished setting the table which looks rather lovely with candles; Charlene comes in and compliments her on the table. Madge feels that after all the trouble they have gone to if Clive doesn't realise how much they care then he will never get the message. Charlene asks where the champagne is and Madge explains that she had sent Shane to get it then she will send him over to get Clive. Charlene thinks it is a good idea which will give them time to get into their gear. Madge is rather reluctant; as she had spent all afternoon cooking Clive's favourite French food surely she could leave the entertainment to her and Shane. Charlene feels that it won't work unless they are all it together. Madge says that she will feel silly and that will put a dampener on the whole evening. Charlene assures her she won't if she keeps reminding herself why she is doing it. Clive wouldn't think twice about it if one of them needed cheering up and besides who will see her. Madge points out that Her, Shane and Clive and that is three too many. Charlene feels that Madge is always too worried about what other people will think, she doesn't know if it will work but no one has come up with any better ideas. Madge finally reluctantly agrees but only because it is Clive. Lucy is walking into the kitchen asking Helen what colour dress will Auntie Rosemary's dress be when she gets married; Helen suspects it will be white. Lucy then wonders if the bridesmaids will be in pink, Helen replies maybe. Lucy asks will the flower girl be in blue, I look good in blue. As Jim comes in Lucy asks how long it takes to get to America. Helen snaps at her that she isn't going and that is final. Lucy thinks it isn't fair and wants to know why they are being so mean to her. Jim tells her that they are not made of money and sends Lucy off to wash her hands. Jim asks Helen not to be too hard on Lucy; she is bound to be excited. Helen replies she knows that but she does go on and on about it. Jim says why doesn't Helen take Lucy with her, Rosemary would love it and they can afford it. Helen tells Jim firmly that she can't take her because she isn't going. Jim looks shocked and says but it is your daughters wedding she will be so hurt. Helen grumpily replies that she isn't a child anymore and that she doesn't need her to hold her hand. Jim asks “Don't you want to go” Helen says that she doesn't. Jim then questions her if the reason for her not wanting to go is because of the man she got involved with over in America. He doesn't think she has to see him just make an excuse and go to the wedding. Helen gets upset and tells him that he is as bad as Lucy going on and on about it, she has made up her mind and she doesn't want to hear any more about it. Clive has his eyes closed, as Shane guides him into the house via the backdoor, Shane asks Clive to smell the aromas of the cooking and suggests they dig in. 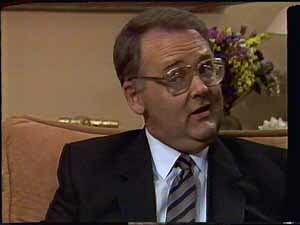 Clive opens his eyes shocked and asks what about Madge and Charlene. As he does Charlene and Madge jump up from the other side of the breakfast counter where they have been hiding dressed as clowns. (Madge has a rather attractive crooked large nose with a nice wart at the end) They jump around Clive making lots of clown noises with whistles. 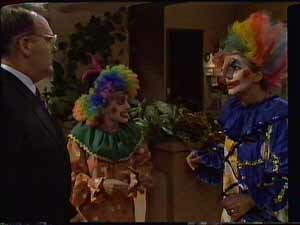 Shane puts on a clown wig and “Groucho Marx” funny nose and glasses and tries to put a wig on Clive. Clive thanks them but says that he really isn't in the mood for a party as he pulls his wig off. Madge says he will when he hears what there is for dinner and goes on to explain the menu as she gets to the sweet, Charlene and Shane dance around again blowing whistles and making lots more noise. Madge asks Clive to sit at the table while she serves up; Clive pulls out the photos of Sam out of his pocket and starts to show the pictures to her. As Madge looks at the dribbling pictures of Sam she pulls her crooked nose down onto her chin and looks at Clive so sadly. Charlene and Shane look on in the background rolling their eyes at them. Scott enters the living room where Jim is reading the newspaper. Rather hesitantly Scott asks Jim if they could have a talk. Scott apologises for his attitude early in the day but feels that Jim was trying to interfere with his life. Jim argues that he just wants what is best for him, Scott replies so does he. Scott wants to know if Jim would be interested to hear what he is doing with his writing. Jim says he is all ears. Scott explains that he wants to establish himself so he can land a cadetship. Jim wonders if that is possible with his HFC results. Scott feels it is a long shot, but he wants to do it his way. If it doesn't work out then reluctantly he agrees to consider going to school. Jim ruffles Scott's hair and says that he can't ask anymore than that. As Helen comes into the room Jim tells her about an article in the paper she may be interested in, there is going to be an art show in town by Gerard Singer. Scott pipes up that it is must be Rosemary's fiancée; Jim feels that they can't be two artists called Gerard Singer. Helen looks visibly upset and replies she supposes not and rushes out of the room. Dismayed Scott asks “Doesn't she care, doesn't she want to see him” Jim shrugs replies “Apparently not” Scott thinks that maybe Helen doesn't like him and that is the reason she doesn't want to go to the wedding. Charlene is complementing Madge on the meal, as Madge tries to encourage Clive to eat up. Clive says that he is really full after all the chicken and thanks for all their trouble and he is sorry he has spoiled it for them but gets up and leaves. Charlene wants to stop him, but Madge feels it is better to let him go. Madge thinks at least they tried, Shane thinks that the whole evening was a disaster from beginning to end, he points at the table as says “Look he has even forgotten his photos” Charlene thinks Clive will back to get them any minute as someone knocks at the front door. Madge tries to take a drink but the nose gets in the way so she moves it to the middle of her forehead. Charlene rushes to the front door thinking it is Clive and opens it with a splutter of raspberry blowing, seeing it isn't Clive she apologises to the man standing there. The man apologises that he must have the wrong house he was looking for a Mrs Mitchell. 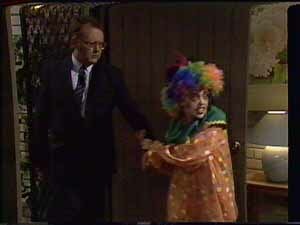 Charlene suddenly realises that the man must be Harold Bishop, and shouts at Madge that she has a visitor grabs Harold's arm and drags him into the living room to an astonished Madge. Madge says that Harold must have wondered what he had walked into them all dressed up like lunatics. Harold laughs and says that it did look a little odd, Madge replies that she would never have let Charlene talk her into it if she had know he was coming, it would have been a lot easier if he had phoned. Harold looks a bit confused and explains that Charlene had invited him. Madge looks at Charlene in dismay; Charlene stutters a garbled explanation about Madge never getting around to it and with all the arrangements for Clive she had forgotten all about it. Madge says she will deal with her later! Harold says that he was glad Charlene had invited him; Charlene is pleased that she has finally got some appreciation. Much to Madge's irritation, Harold feels it was just the kind of thing Madge would have done, he should have recognised it straight away although it has been twenty years. Madge crosses her arms annoyed and says “Well you know you have changed yourself you know” Holding Clive's photo's Shane makes an excuse to leave saying he is just going to see if Clive is Ok. The atmosphere in the living room is a bit awkward as Madge and Harold agree that it is been a long time. After another awkward silence Madge jumps up and offers Harold a glass of champagne or a beer, Harold again declines, leaving them again sitting in silence. They keep mumbling that it had been a long time, Charlene gets rather bored by this and finally breaks the ice by saying “Ok it has been a long time, come on tell me the juicy details” Harold wants to know what details she wants to know. Madge is horrified; undaunted Charlene wants to know if Madge kissed him on her first date. Harold is coy and says that she better ask Madge that. Charlene says she has and she won't tell her. 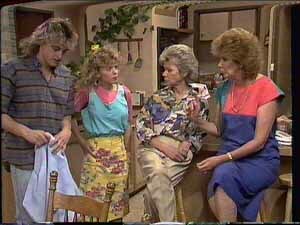 Madge protests that she thinks they should change the subject but Charlene continues and wants to know if Madge was always home by 9 O'clock. Harold laughs and says that Madge was never home before dawn and always kissed on the first date and sometimes before the first date. Madge protests that Harold should stop it, she will never be able to control Charlene. Harold just laughs and says “Well you know what they say like mother like daughter” They all are laughing, as Madge is embarrassed. Clive is sitting on the floor in the hall, with what looks like a bottle of rum in his hand, as the front door is knocked on loudly. Shane comes in and hands Clive his photos sitting down he picks up the bottle and tells him that he won't find the answer in here. Clive replies that it is just for atmosphere he isn't really drinking; there is only ginger ale in the bottle. Shane tells Clive that some relationships just aren't meant to work out like his with Daphne after a while the hurt goes. Clive wants to know what he is to do in the meantime. Shane says that he has to face the truth, it just wasn't meant to be and it was better that it ended when it did. Clive feels that that is easily said; Shane says that he still thinks of what might have been between him and Daphne. It didn't work out, the same as between Clive and Susan but Paul would have always been between them. Clive bitterly says that Paul would have made sure of that. Shane replies that Paul is upset to, but Clive replies that he can't feel sorry for him. Shane argues that they are in the same boat; Clive agrees that maybe they are but he will never give Paul Robinson the time of day as long as Clive lives. Shane replies that he is only trying to help, Clive replies that he should shut up and join him in a glass of ginger ale.